The Savvy Caregiver education class is an award-winning DVD series for families designed to be watched once per week for four weeks. The Savvy curriculum has been shown in university research to reduce caregiver distress and has been recognized nationally by the U.S. Administration on Aging. This program is available for checkout from the WyCOA lending library to healthcare programs, instructors, and family caregivers. 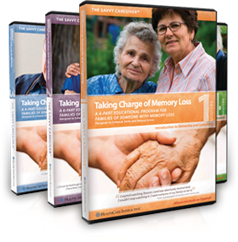 Click Here to learn more about the Savvy Caregiver curriculum or call (307) 766-2829 to request this DVD series.